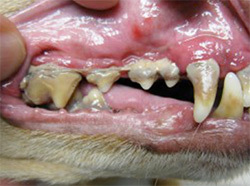 Pet dental care is just as important as your own. An unhealthy mouth can lead to discomfort, pain, damage to other body organs and not to mention BAD BREATH! What does a healthy mouth look like? A healthy mouth will have 'salmon pink' gums, even on the gum margin (the area of gum which meets the tooth).Teeth will be lovely and white. You may see small areas where tartar is beginning to form. Tartar is formed by plaque bacteria ‘sticking’ to the surface of the tooth. This is the perfect time to start preventative dental care at home. The first signs of dental disease can be seen here. You can see a thin line of tartar, which is beginning to irritate the gum margin. 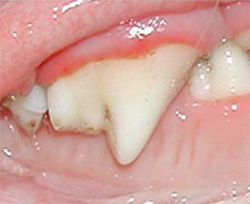 This reddening of the gums is called gingivitis. The gum, like skin, is a barrier protecting the body from the outside world. If it continues to be inflamed the gum may recede away from the tooth or bleed, allowing bacteria into the blood stream. The severity of gum recession will determine the treatment required, although at this stage home dental care is usually a good option. Gums look swollen due to inflammation. This will be uncomfortable for the pet and may bleed when chewing on food or toys. Tartar is a build up of calcified plaque bacteria. This will cause bad breath, as well as irritating the gums. Plaque ‘sticks’ better to an uneven surface, so as more tartar forms, the easier it is for plaque to take hold. Dental treatment under anaesthetic would probably be required. There is a high risk of bacteria from the mouth entering the blood stream. This can effect all the organs of the body. Areas of ulceration may develop. Without removing the tartar under anaesthetic it is difficult to tell if there is a healthy tooth below the tartar. It is also difficult to gauge how much gum recession there is. Toothbrushing is the best method of keeping teeth clean, it is also the cheapest. Below is our guide to toothbrushing, but if you are not confident we can offer a free appointment with a Veterinary Nurse for a quick lesson. Use CET Poultry or fish flavoured toothpaste on your fingertip. Gently lift up your pet’s lip and rub softly. Top Tips: Do this at the same time every day and give a reward afterwards. Avoid the incisors (the small teeth at the very front), as these can be sensitive to begin with. 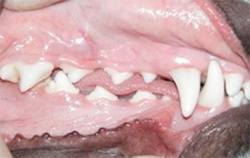 Do this for 30 seconds, once daily, until your pet is comfortable with you touching the teeth and gums and rub softly. Move on to using a finger brush, again with the flavoured toothpaste. Top Tips: If you have a cat or small dog you may wish to jump to step 3, as the finger brush may be a bit big for your pet. Move onto a pet toothbrush with CET flavoured toothpaste now. Brush for 30 seconds on each side of the mouth, once daily. Top Tips: Once your pet is happy with tooth brushing change to Dentagen toothpaste. This is not flavoured, but coats the teeth to prevent plaque build-up. If your pet will tolerate it, an electric pet toothbrush is very effective. We stock a range of Dental Diets made by Royal Canin and Hills. These are dry diets with kibble specially shaped to clean the teeth. The Royal Canin diet also contains an ingredient to prevent plaque 'sticking' to the teeth. We also have a range of other dental products and offer free advice through our Pearly Whites Club. These are consultations run by our Registered Veterinary Nurses to advice on all aspects of dental care. It is important to remember that pets may not always show obvious signs of dental disease or dental pain, so regularly lifting up your pets lip to have a look is a good idea. Other signs to look out for include *bad breath *lip licking *drooling *eating more carefully/slowly or only using one side of their mouth *becoming fussy with food *playing less *grumpiness *sleeping more. If you have noticed any of these signs please speak to a member of staff.